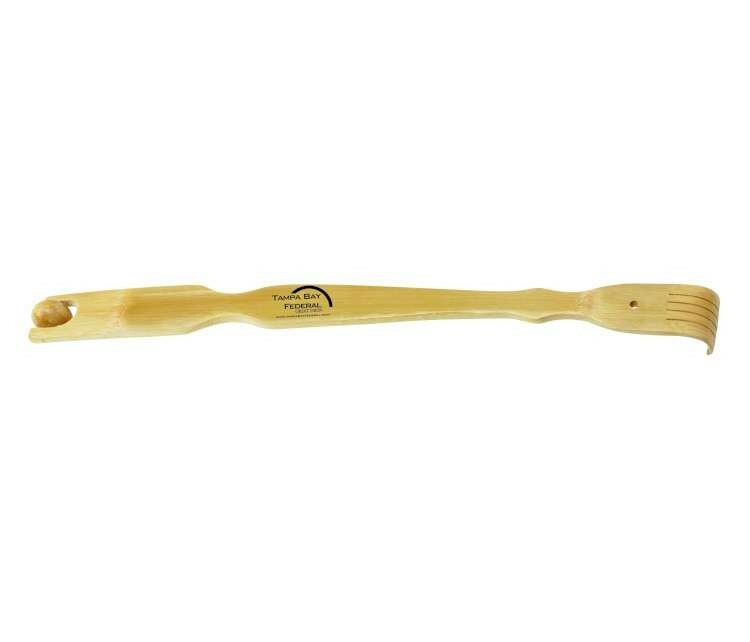 Delight them with this 19" deluxe wooden bamboo back scratcher with massage roller. Superior 2" width for extra strength. Feel the pleasure in the gentle relief of an itch in hard to reach areas on the back. 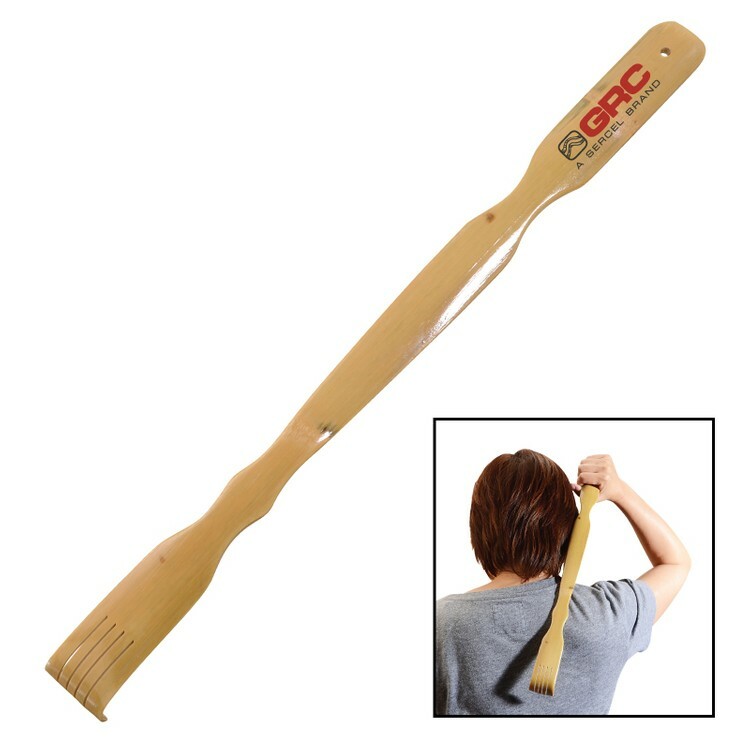 Strong, rigid and durable, bamboo back scratchers are superior to their plastic counterparts that are not as rigid and do not scratch effectively. Comes with a sturdy roller on opposite end of massager. Perfect for promotions related to health & stress or just simply for fun ! 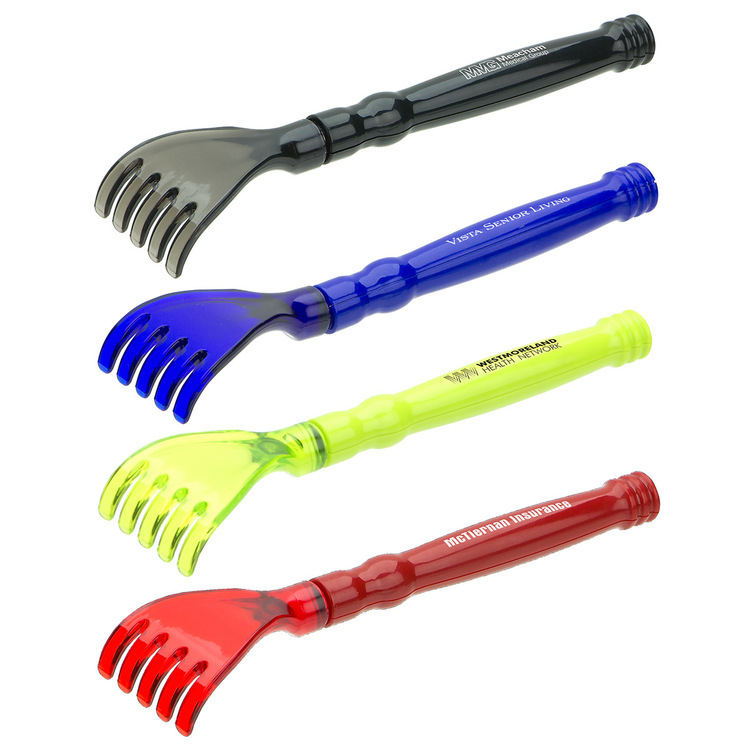 Folding back scratcher. Folds in half. Three surfaces with differing tactile levels. This folding back scratcher measures 14" long. When closed, 7-1/8" long x 1-1/4" wide by 1" thick. Ends are different for optimal scratching. Comes in three colors to choose from. Includes one color imprint in one location. Get at those hard to reach clients! 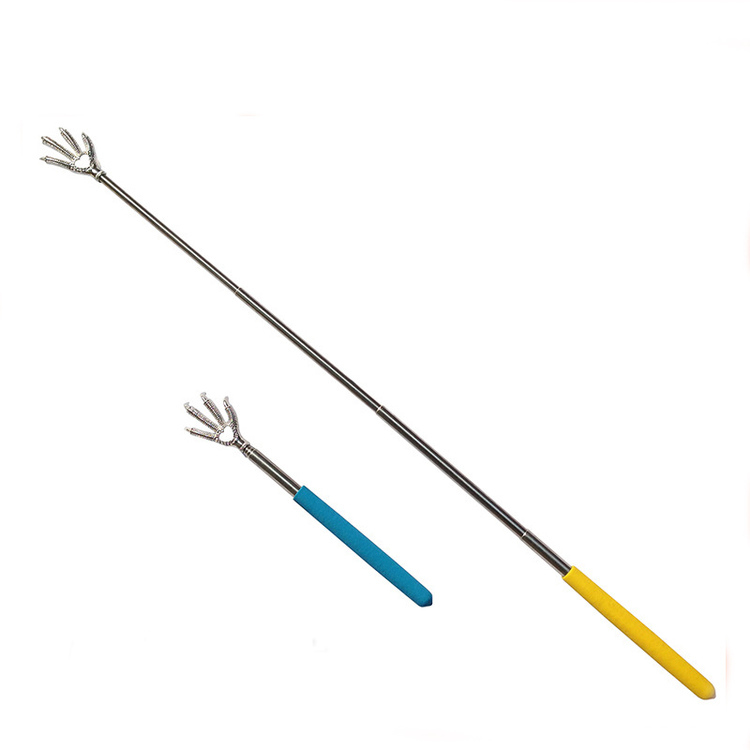 Our extendable back scratcher extends 22 1/2". 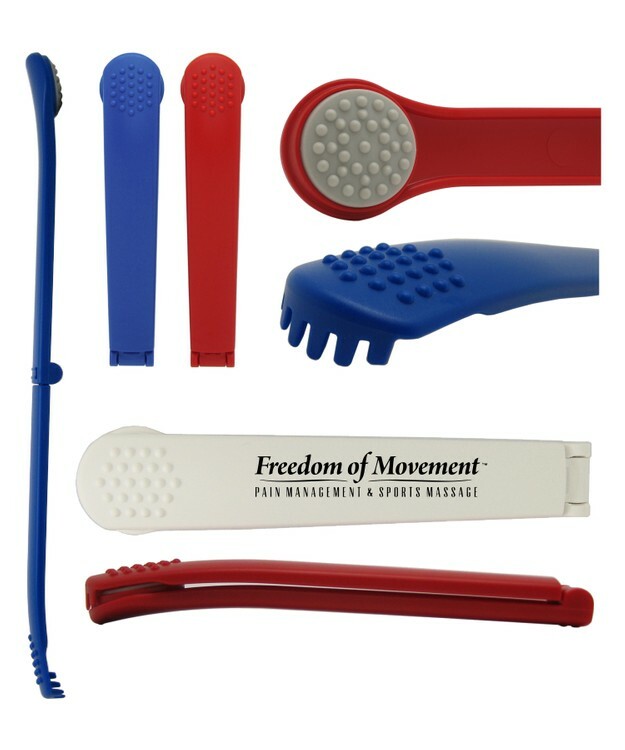 A perfect promotion for chiropractors offices, medical offices, retirement homes, spas and more. Available in red and blue. Plastic. One color imprint only. 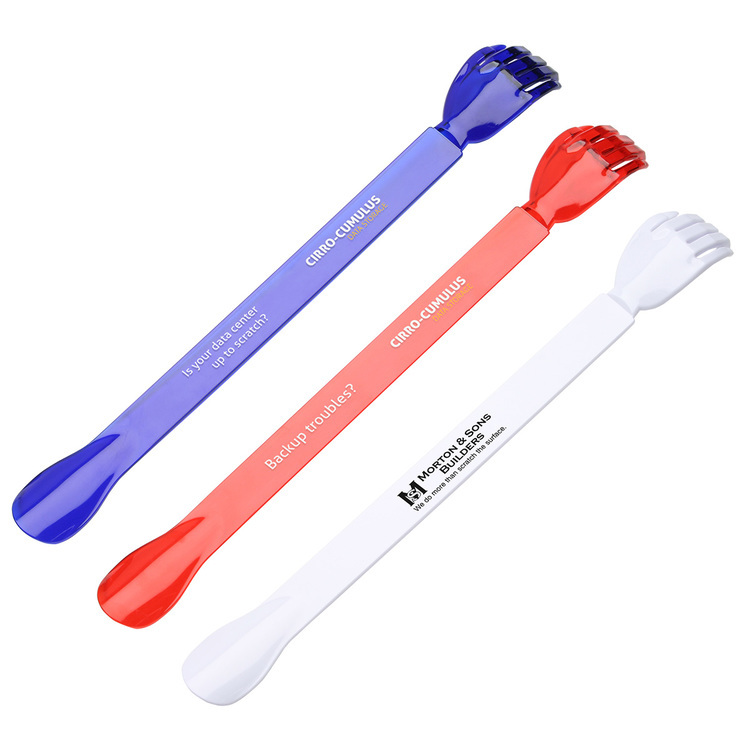 Union Printed, Foldable Back Scratcher & Massager, 2-in-1 Handy Tool, 15" long Back Scratcherr will ensure that even the most annoying itches in hard to reach places don't go unscratched. 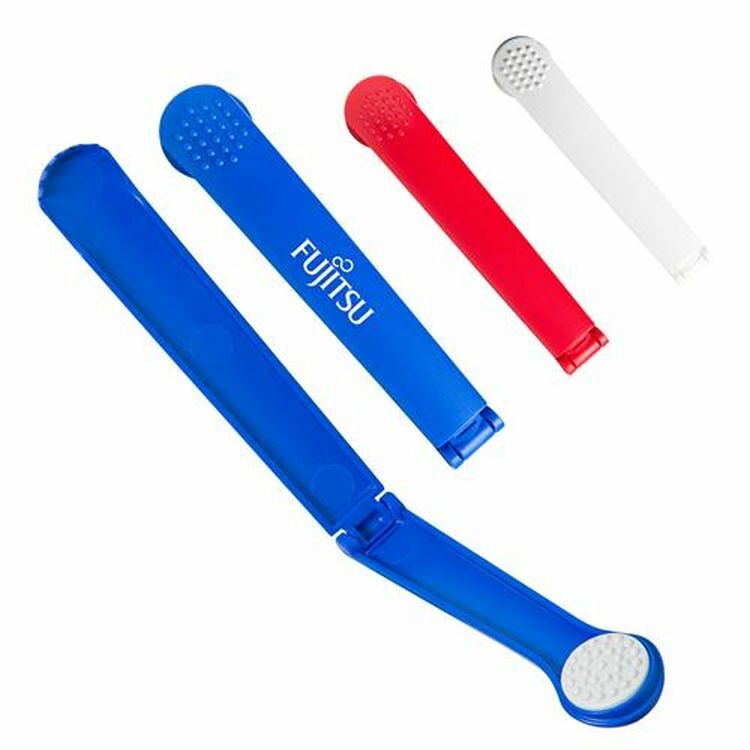 Two level Massager Feels Amazing & Helps relieve aching muscles all over your body. Folds in half So it's easy to Carry in your purse or bag even in Your Pocket or store in a drawer for easy accessibility. Decorated in our Union Shop - Union Bug Available at No Charge! Get at those hard to reach clients! 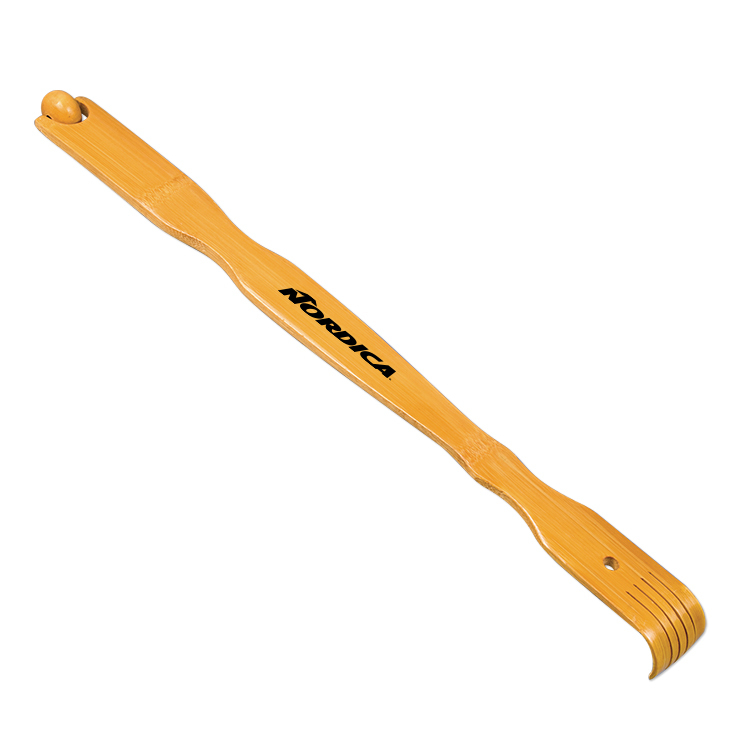 Our wood back scratcher provides relief for itchy skin and features two rollers for massaging sore backs. They are are a perfect promotion for chiropractors offices, medical offices, retirement homes, spas and more. One color imprint only. 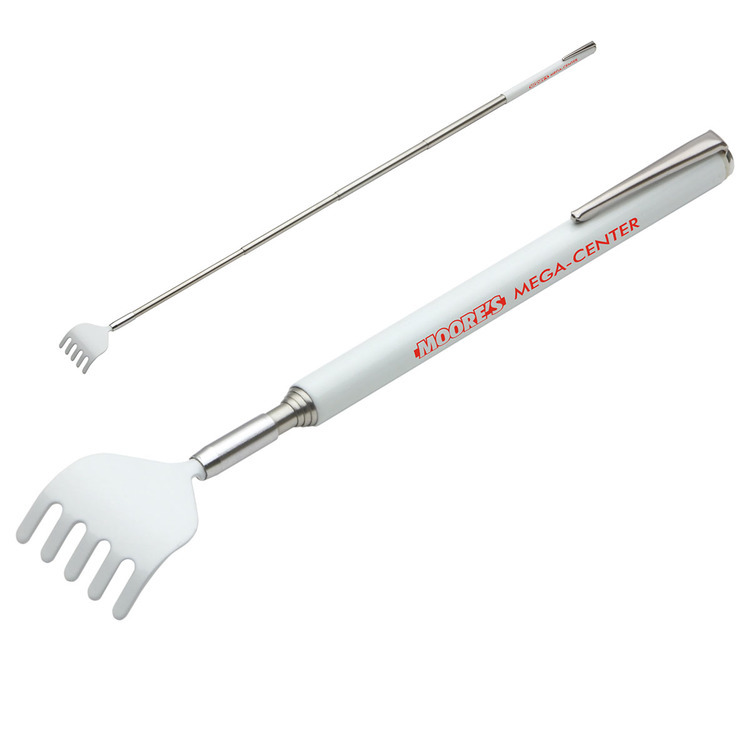 The backscratcher is extendable with 23 inch when it extends. It is convenient and comfortable for your daily using. 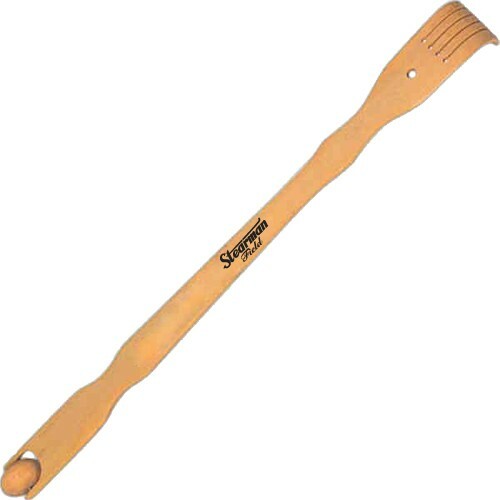 The back scratcher is best choice to scratch your back. Getting relief to those troublesome itchy spots, great for reaching those hard to reach places. The imprint area is on the handle. 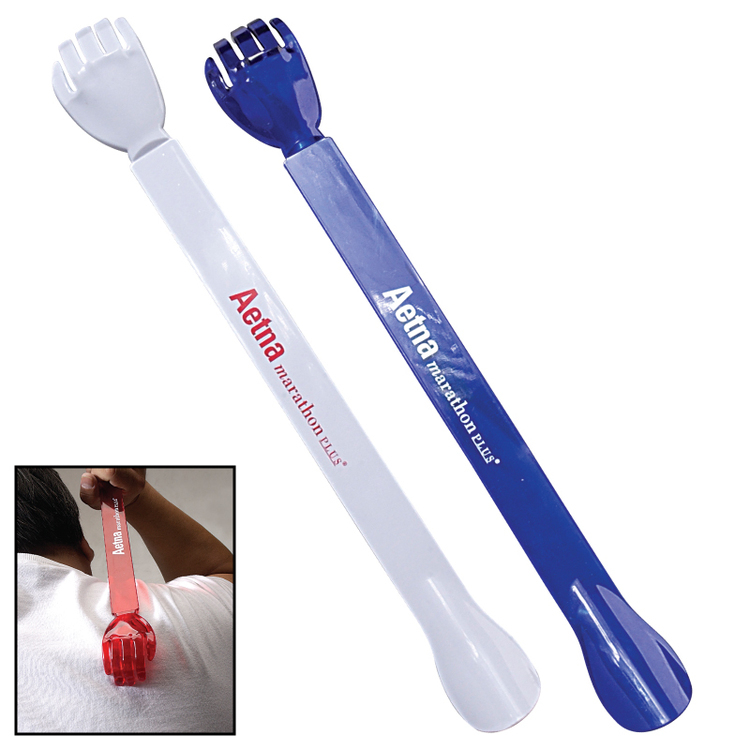 Extendable Back Scratcher. Five colors available : Blue, Red, Green, Black and Navy Blue. Please specify color when ordering. 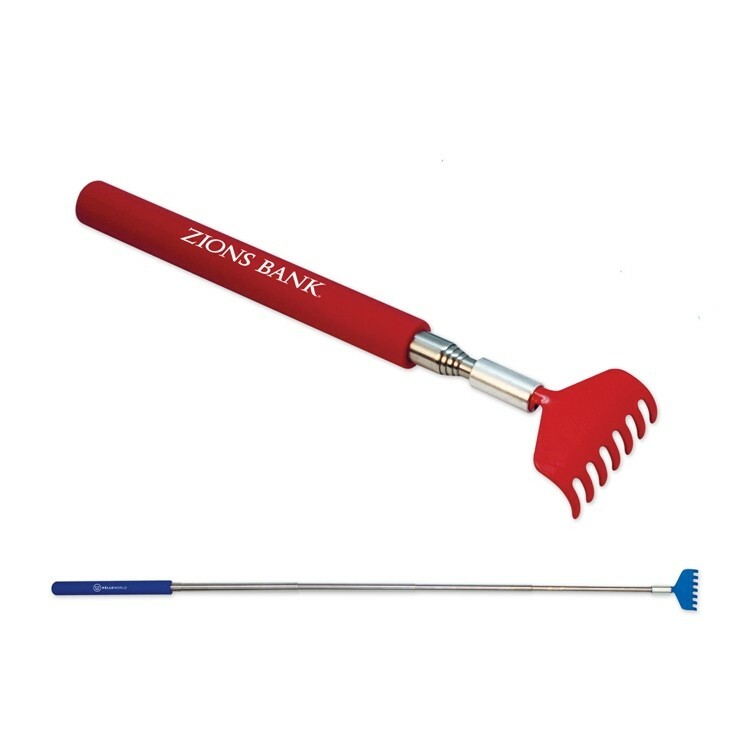 One side of this little tool features a back scratcher and the other side is massager for those hard-to-reach places. The extendable back scratcher telescopes down to just 20cm/7.9" long,and it is portable and easy to carry,which is long enough for effective use. 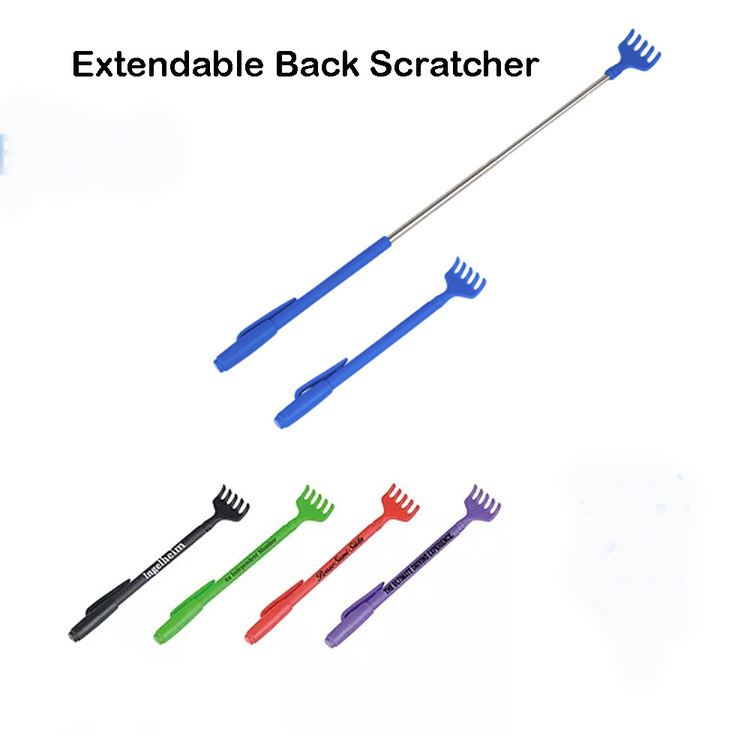 The back scratcher has a seven-tooth scratching edge and telescopes open to a full 68cm/26.8" long to easily reach anywhere you need to scratch. The logo is printed on the handle, because of the rough handle, please send us the artwork for advices before placing the order. Get at those hard to reach clients! 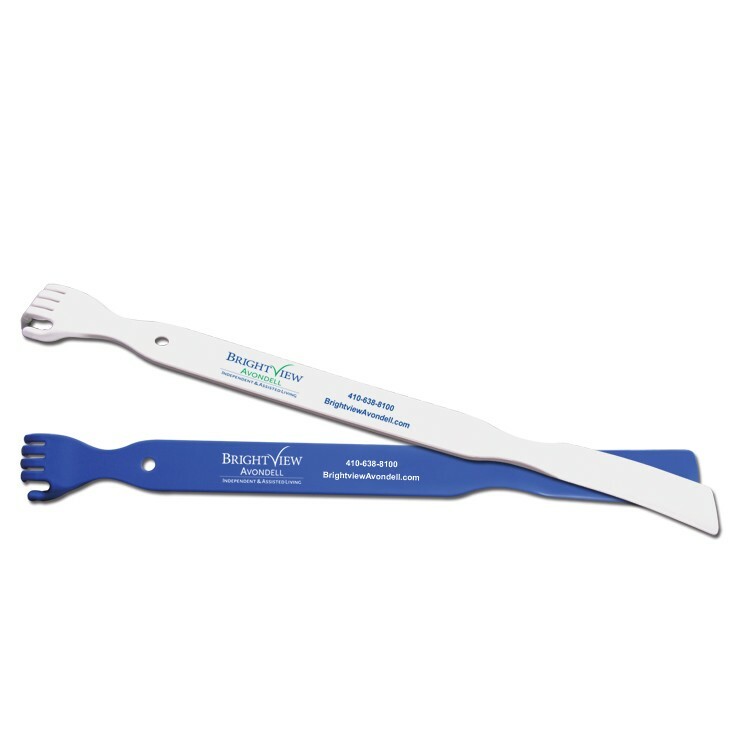 Our wood back scratcher provides relief for itchy skin. 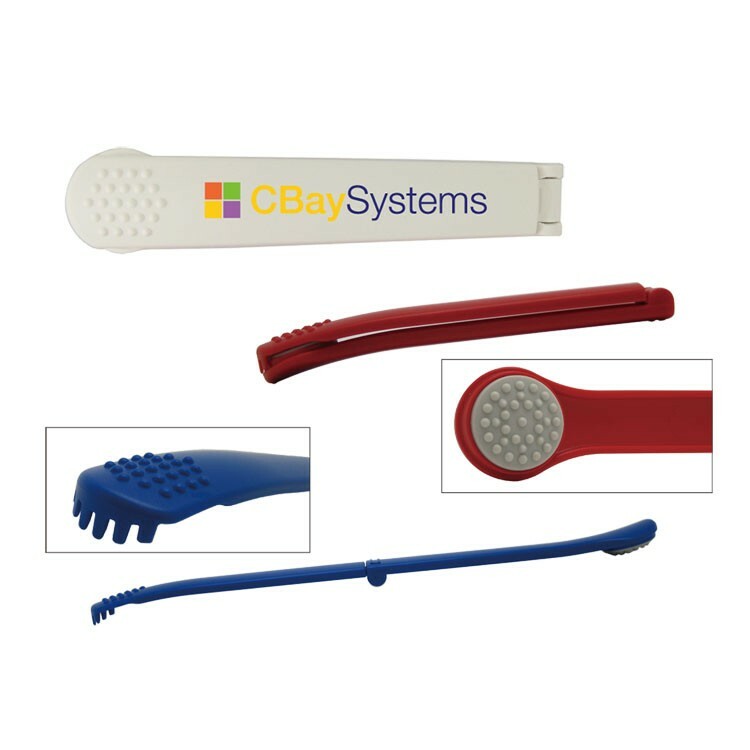 They are are a perfect promotion for chiropractors offices, medical offices, retirement homes, spas and more. One color imprint only. 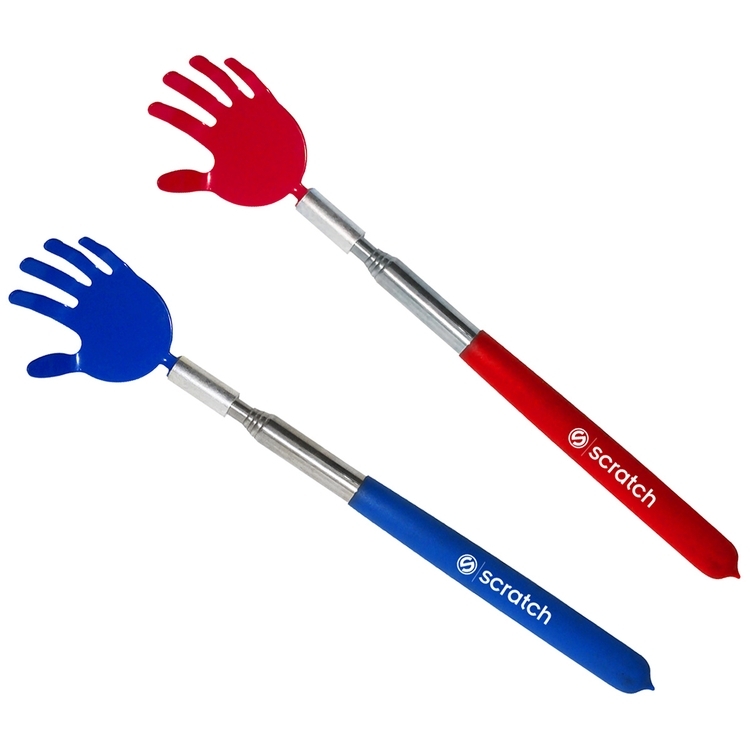 The back scratcher is sure to provide relief for those hard to reach spots. It is 9" long when compact, but extends to 28". 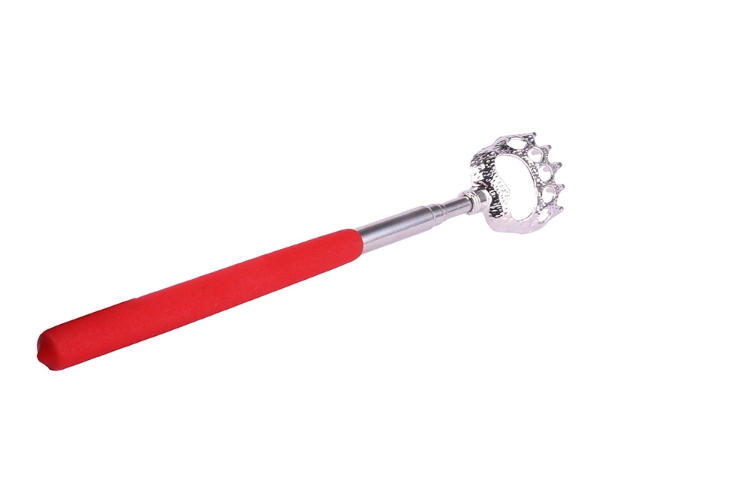 This back scratcher is made of Stainless steel material and rubber handle. It extends from 8.6" to 23" and easily fits into a pocket or purse. 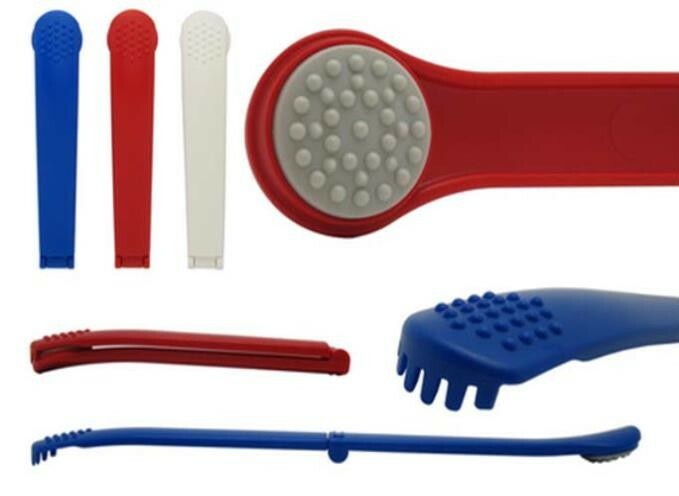 This is the best choice for scratching and as body massage tool. 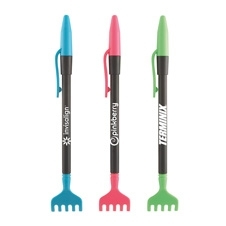 Come in 3 colors and silkscreen your logo on the handle for a long lasting promotion. Bamboo back scratcher. Includes shoe horn. Made of sustainable environmental friendly bamboo. Handcrafted, thus the consistency of the grain, stain, and color may vary. 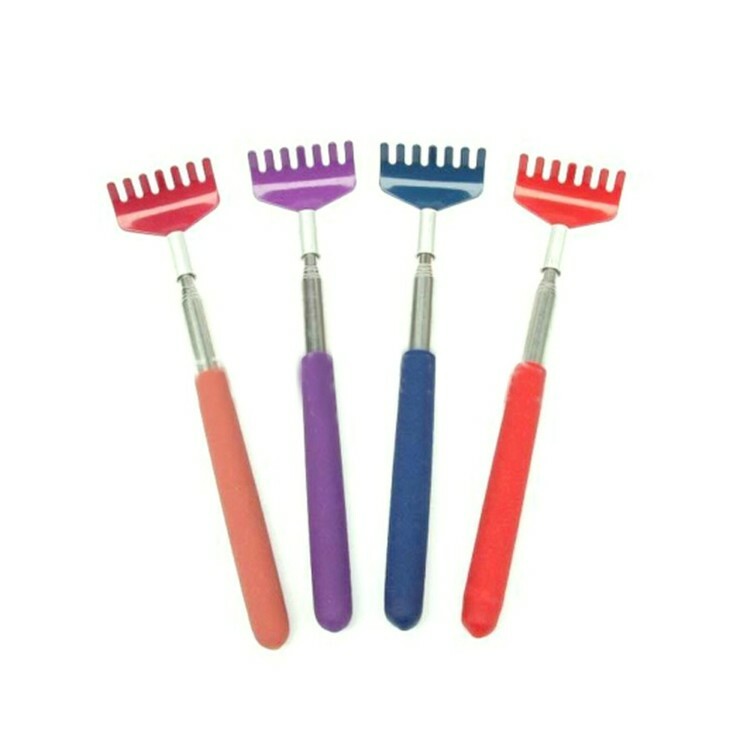 Durable melamine plastic back scratcher. Includes shoe horn and beaded chain for easy storage. 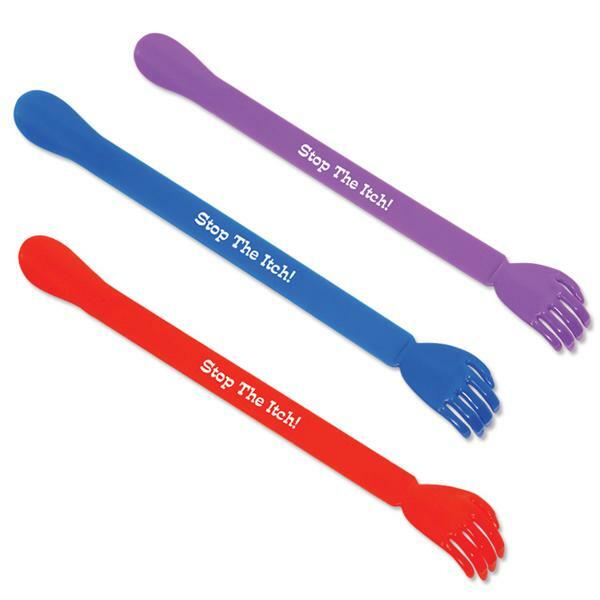 The long reach keeps you from stooping to slip on your shoes or gets that nasty itch that is difficult to reach. Functional and affordable. All plastic material. 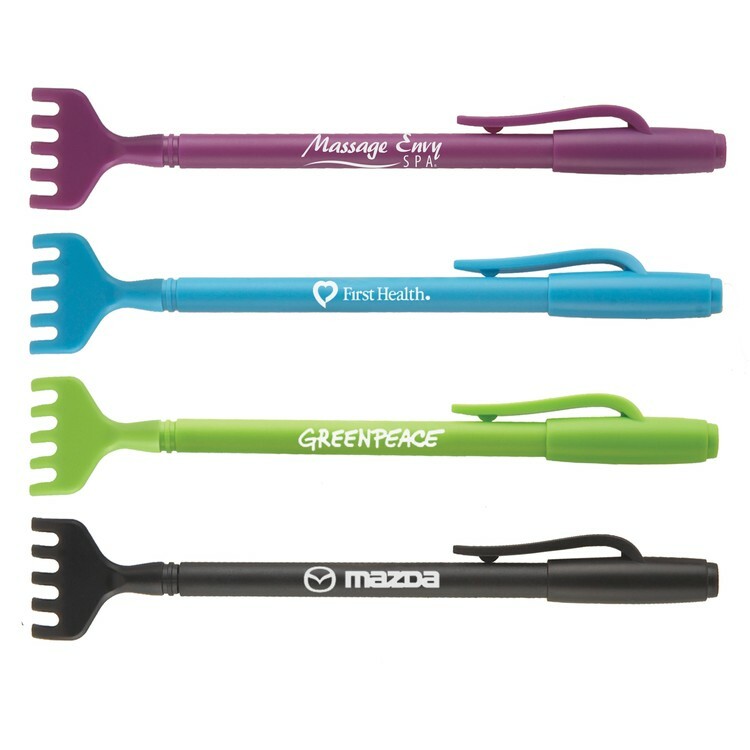 We've put those hard to reach places in reach with this bamboo back scratcher and massage rollers. 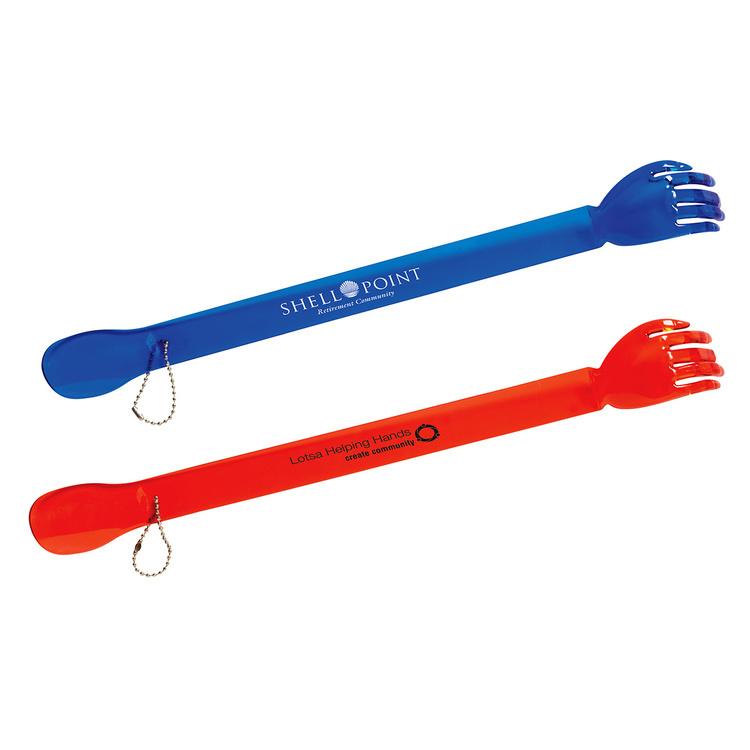 Each measures 19'' tool features your brand for a promotional product that has the staying power you need for excellent repeat exposure and top-of-mind brand awareness. 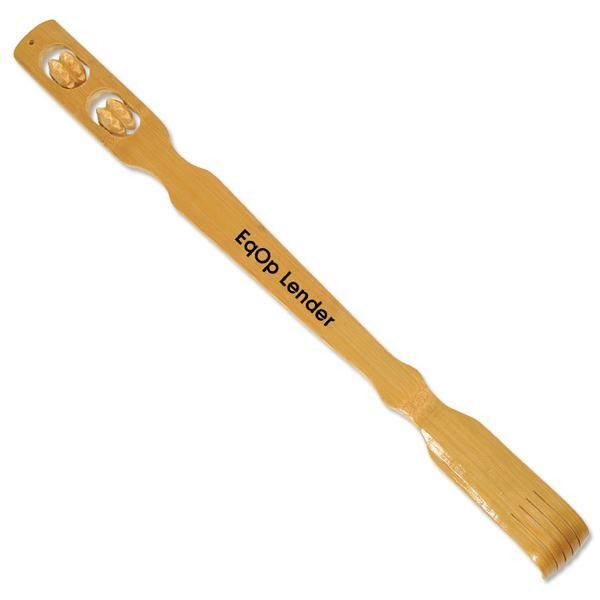 Use the scratcher for those hard to reach itches or flip it over for a relaxing massage function. 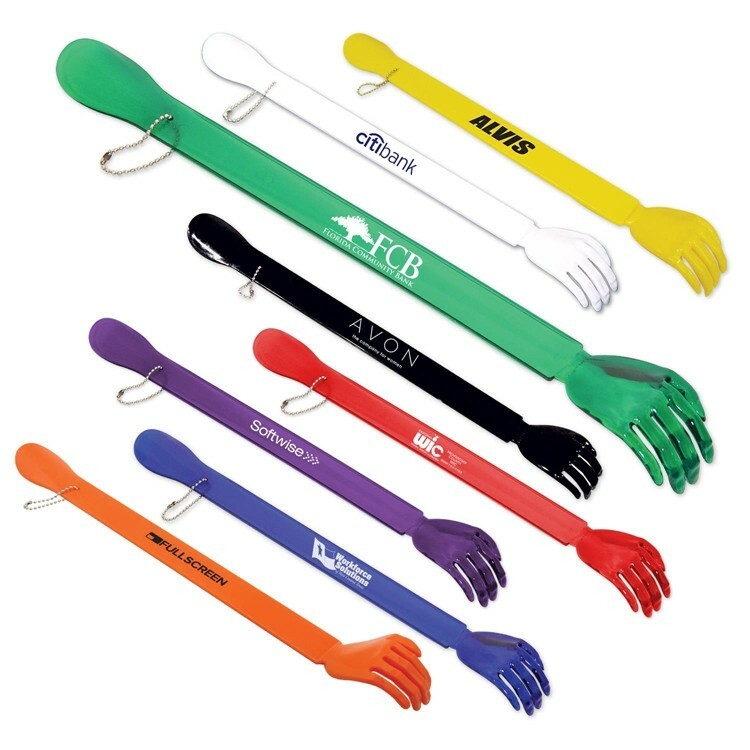 Go with a promotional product that recipients will love!